This stylish counter depth design features Food Showcase with Metal Cooling and high-efficiency HE LEDs illuminating virtually every corner. Enjoy chilled drinks at the push of a button with an external filtered water and ice dispenser. Plus, this refrigerator is ENERGY STAR compliant for energy savings. Outside, this built-in panel-ready French door refrigerator seamlessly integrates with your kitchen cabinetry. Inside, its Preserva<sup></sup> Food Care System features three technologies that work in concert to assure crisp produce and deliciously flavourful foods while helping to eliminate refrigerator odours, and the beautiful glossy silver Platinum Interior Design highlights the metallic accents of the shelves, crisper and baskets. 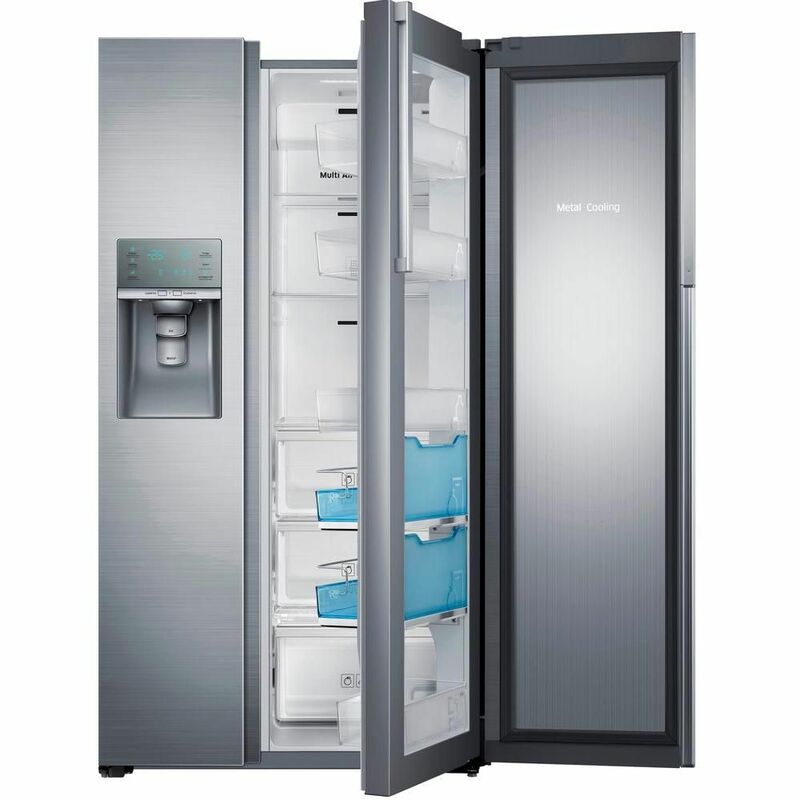 Maxx Cold X-series 48 in. Commercial Sandwich and Salad Station has a capacity of 12 cu. ft. as well as 26 sq. ft. of shelf space. The unit features a two section cabinet with two solid hinged doors, recessed handles, all stainless steel exterior and a painted aluminium interior. An electronic thermostat and digital LED temperature display is simple and visually stimulating while a 1/2 HP compressor provides efficient and reliable service. The unit also includes a heavy duty cutting board, insulated top cover, and (12) 1/6 size polycarbonate pans. 22 cu. ft. Side-by-Side Refrigerator in Stainless Steel - ENERGY STAR® This stylish counter depth design features Food Showcase with Metal Cooling and high-efficiency HE LEDs illuminating virtually every corner. Enjoy chilled drinks at the push of a button with an external filtered water and ice dispenser. Plus, this refrigerator is ENERGY STAR compliant for energy savings. 22 cu. ft. Side-by-Side Refrigerator in Stainless Steel - ENERGY STAR® is rated 4.3 out of 5 by 189. Rated 5 out of 5 by Grace from A new design. The frozen part is bigger than I... A new design. The frozen part is bigger than I expected. Rated 5 out of 5 by Anonymous from Very quiet when compared to my old refrigerator. It draws... Very quiet when compared to my old refrigerator. It draws about 12 amps when connected to the outlet then it quickly drops to about 7 - 6 amps until the compressor shots down. The water pump and compressor turn-on simultaneously drawing a large amperage. I am using a 20 Amps circuit breaker. Rated 5 out of 5 by Daniel41499 from Amazing Fridge I initially wanted the family hub one with the large screen but I saw that this one was on sale and I couldn’t justify spending over $1000 more just for that one feature that I’ll probavly will never use. I have owned this fridge for about 2 years now and haven’t had one issue. It’s quiet, very attractive and everything has a solid feel. I was hesitant on getting such a low cu ft fridge but I was tired of our standard depth. There just wasn’t enough space from the fridge to the counter and people always had to squeeze past each other in the kitchen. This helps so much by giving us a few extra inches of room. I don’t notice the smaller interior size much because the layout is VERY well though out and it can store way more stuff inside than our larger standard depth model. I can’t say enough good things about it. For the price on sale the quality and features can’t be beat. Rated 1 out of 5 by DontBuythis from Do NOT buy this model refrigerator. The ice maker is just bad. Really bad. It fails on many of t... Do NOT buy this model refrigerator. The ice maker is just bad. Really bad. It fails on many of these. Look at the internet reviews and you will see. Also, when this model fails there are only a few components that can be replaced. Outside of those it is basically UN-repairable. My ice-maker failed after 18 months because of something in the (irreparable) door assembly. Not worth the risk to keep putting money in it. Also, the WIFI controls are useless and do practically nothing of value. Rated 1 out of 5 by Anonymous from Awful product I purchased this item just about a year ago and have had it worked on 3 times so far. This is something that I will never tell a friend to purchase. I wish I had looked around more. Rated 5 out of 5 by BrianJ_57 from Modern Look with Door Handle-Free Design Purchased May 2018. Very pleased with refrigerator.